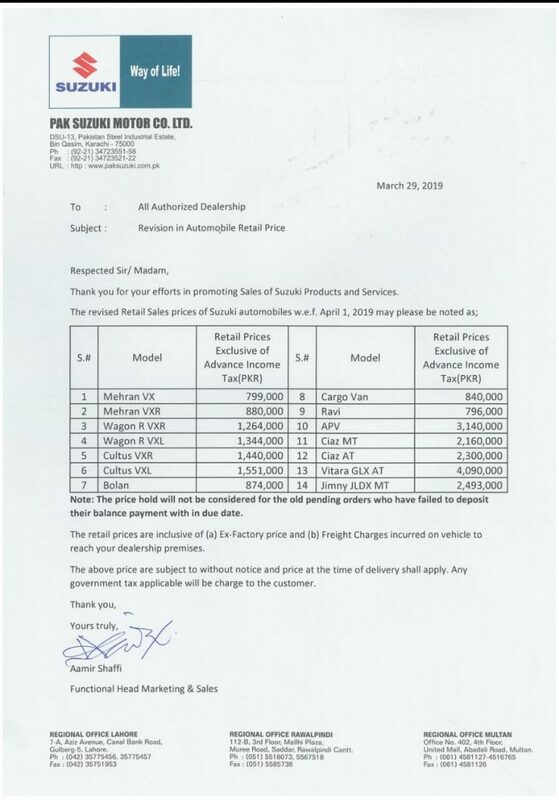 Following the rupee devaluation, Suzuki Motor Company Ltd (PSMCL) has increased its car prices between Rs20,000 to Rs1,00,000 – for all models, effective from April 1, 2019. According to a company’s notification received by dealers, PSMCL raised the price of Suzuki Mehran VXR model to Rs880,000 from Rs860,000. The new price of the most popular car Suzuki Mehran VX has been fixed at Rs799,000. Suzuki Bolan and Bolan Cargo will now cost Rs874,000 and Rs840,000 versus the previous prices of Rs854,000 and Rs820,000 respectively. The price of Wagon R VXR and Wagon R VXL has been raised to Rs1,264,000 and Rs1,344,000 from Rs1,224,000 and Rs1,314,000 respectively. PSMCL said the price hold will not be considered for old pending orders which failed to deposit their balance payment within tentative delivery date of vehicles. The new price of Cultus VXR has been increased to Rs1,440,000 and Cultus VXL Rs1,551,000 compared to previous prices of Rs1,410,000 and Rs1,531,000 respectively. The retail prices are inclusive of ex-factory product price and freight charges incurred on the vehicle to reach dealership premises. The prices of Suzuki APV Ciaz MT, CiazAT, Vitara GLX AT, and Jimny JLDX MT has been increased to Rs3,140,000, Rs2,160,000, Rs2,300,000, Rs4,090,000, and Rs2,493,000 respectively. On the other hand, Honda Atlas Cars (Pakistan) Limited (HACPL) has raised the rates of its cars by up to PKR 85, 000 which will come into effect from 1st April 2019. 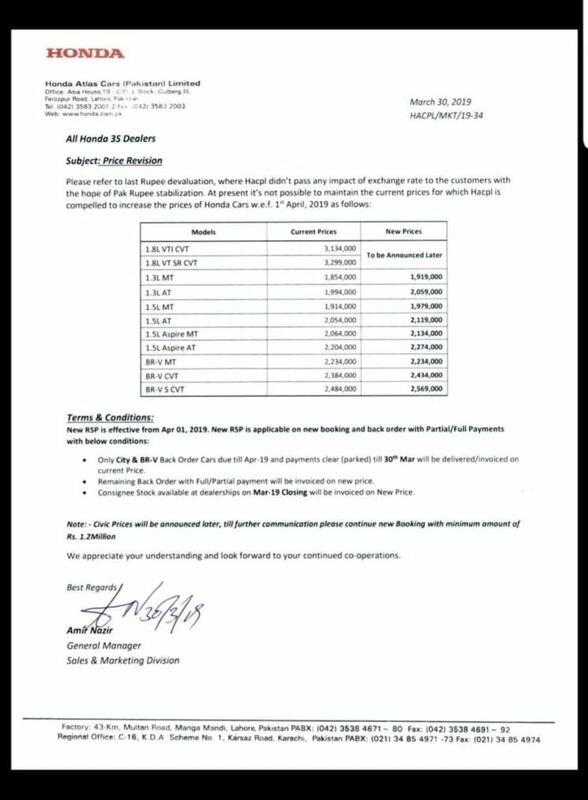 According to the notification issued by Honda Atlas to all its 3S dealers, a further devaluation in the value of Pakistani Rupee against the US dollar has resulted in the increase in cars prices. The company says that previously the it didn’t pass any impact of the devaluation on its customers expecting the stabilization of the currency. As the currency further depreciates, the auto manufacturer is forced to increase the prices of its cars. Honda has not yet increased the prices of Civic variants as it would be announced later. However, Honda City and BR-V will see an increase ranging from PKR 65, 000 – 85,000 as per the new circular issued. Only the back order cars due till April 2019 and those with cleared payments till 30th March 2019 will be sold at the old price whereas those with partial or full payments will be invoiced on the revised price. Furthermore, the consignee stock available at the dealerships until the end of March 2019 will also be delivered at a newly announced price. According to the circular, all the new bookings will take place at a minimum price of PKR 1.2 million. It is important to mention here that this is the second time in this month that seen a price hike in Honda models. Previously there was a price hike in Honda Civic variants due to the levied 10% FED on locally made cars of 1700 cc engine displacement and above by the government. Previous articleNo mass production of Suzuki Alto 660cc has been started yet in Pakistan!! !